72 / the tasting panel / december 2016 INNOVATION W e've all heard it or even said it about our industry before: When it comes to integrating technology into the field, it's a dinosaur. 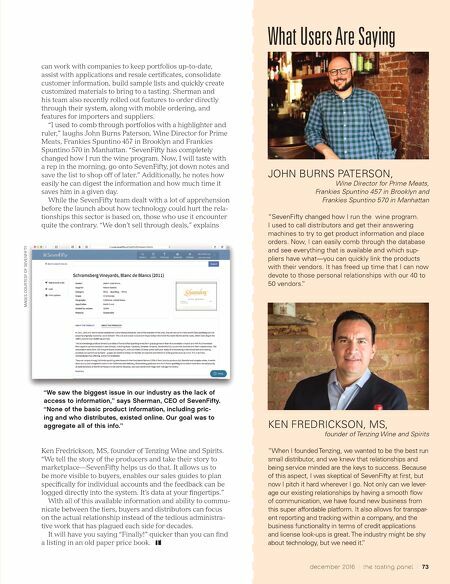 Wine and spirits buyers still order off paper lists, and distributors spend hours tailoring sell sheets for each account. Having worked on both the retailer and distribution side of the equation, Aaron Sherman, along with co-founders Neal Parikh and Gianfranco Verga, decided that the industry needed to come out of the dark ages. Their platform, SevenFifty, launched in New York in 2012 and has expanded to 32 states, 800 distributors and over 35,000 retailers. "We saw the biggest issue in our industry as the lack of access to information," says Aaron Sherman, CEO of SevenFifty. "None of the basic product information, includ- ing pricing and who distributes, existed online. Our goal was to aggregate all of this info." SevenFifty allows buyers to search easily through portfolios and educational materi- als, share lists with staff and partners and follow trade events on its calendars. On the distributor side, the platform industry before: industry before: industry the field, it's a paper lists, sheets for each and distribution co-founders Neal Parikh come out New distributors includ- platform HOW THE TECH PLATFORM SEVENFIFTY IS SIMPLIFYING THE THREE-TIER SYSTEM by Emily Coleman Game CHANGER Aaron Sherman, co-founder and CEO of SevenFifty. 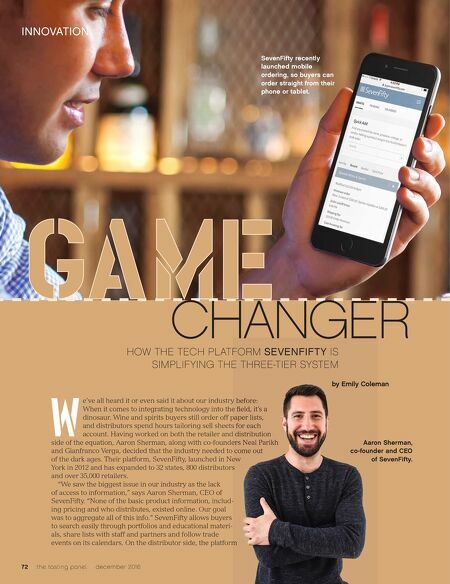 SevenFifty recently launched mobile ordering, so buyers can order straight from their phone or tablet.